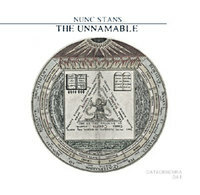 The Unnamable is a broad, sweeping work of often immense vistas and beatless atmospheres. These dynamic and engaging dronescapes reveal a darker and more intense Nunc Stans, one aimed more at transcendence than description. Immersive and sonically rich, this release will appeal to listeners of Steve Roach and related deep ambient drone works. Performed by Anthony Paul Kerby using a variety of synthesisers, acoustic guitar, and studio processing.